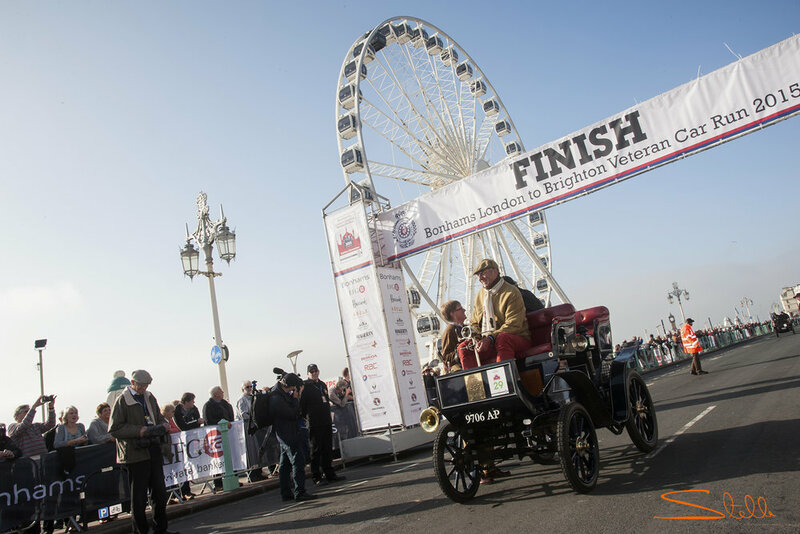 The London to Brighton Veteran Car Run is the longest-running motoring event in the world. More than 400 pioneering veteran cars (built before 1905), their drivers and passengers gathered in Hyde Park on Sunday 5 November waiting for daybreak to signal the start of the annual Bonhams London to Brighton Veteran Car Run supported by Hiscox. 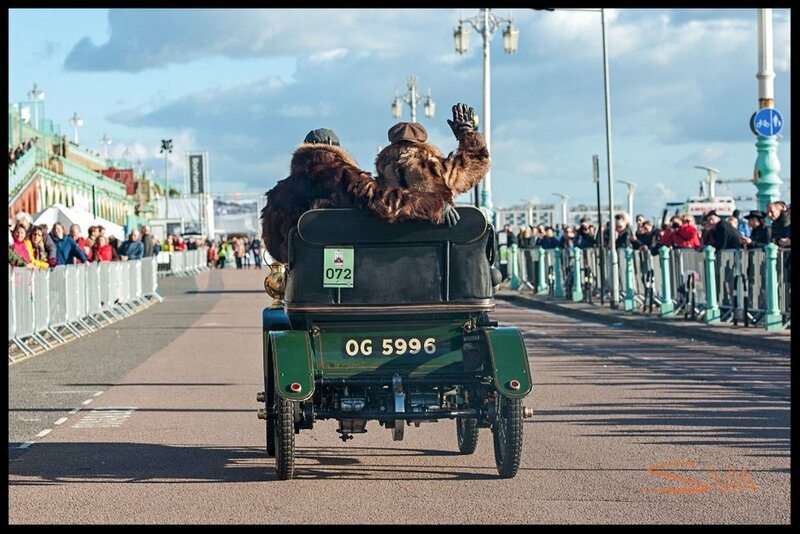 Participants headed off for a nostalgic drive to the Sussex coast, where I was waiting to photograph them cross the finishing line to the rapturous cheers and applause of the crowds at Madeira Drive, Brighton. This year the Run featured the largest entry in recent years, staged as it has been since 1930, by the Royal Automobile Club. The route this year took a detour to avoid the roadworks in Brixton as the map below shows. 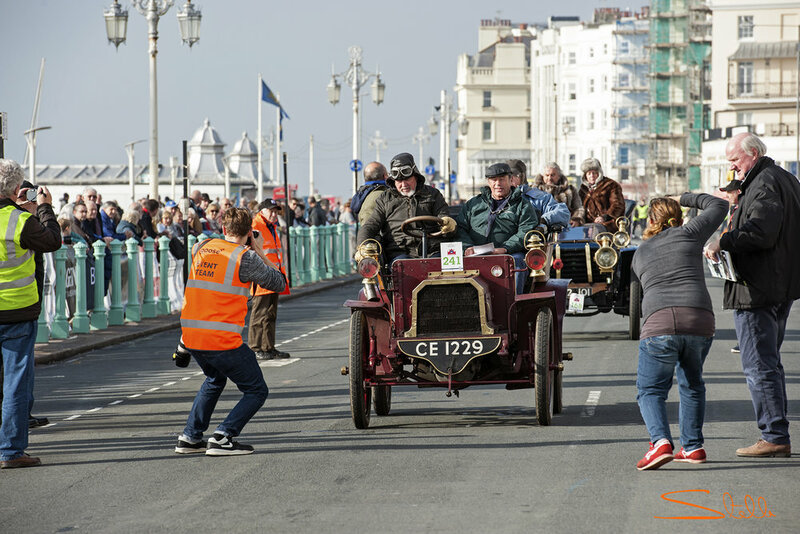 Although a number of cars were diverted following a road traffic accident involving one of the participating vehicles, 315 of the 401 starters made it to Brighton to claim a coveted finishers’ medal before sunset at 4.30pm. 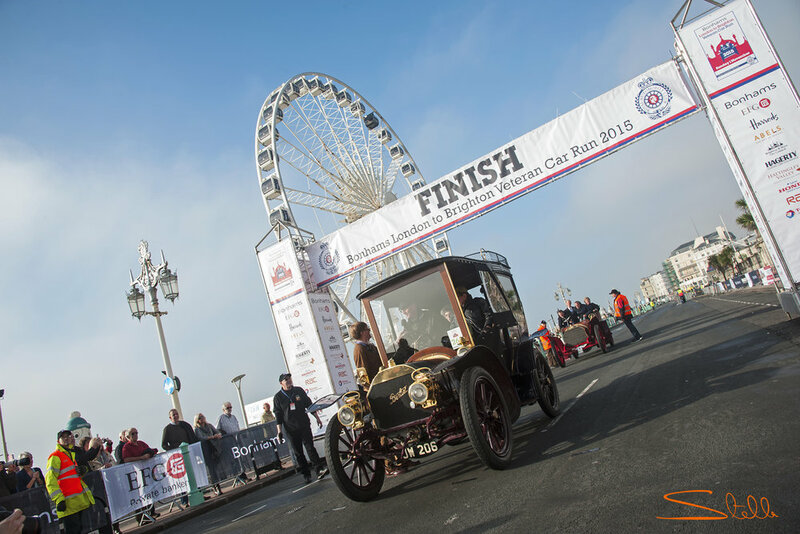 This year's Veteran Car Run marked 121 years since the original 'Emancipation Run', which was held in 1896 to celebrate the Locomotive on the Highway Act. This raised the speed limit for ‘light locomotives’ from 4 to 14 mph and abolished the need for a man to walk ahead waving a red flag to warn pedestrians and horse riders of its approach. The event’s ceremonial start includes the tearing in half of one such red flag, a poignant reminder of the liberation we commemorate on this annual ‘Emancipation Run'. I particularly enjoy photographing this annual event because of the atmosphere and the fascinating history associated with each car, I have included some of the histories to accompany a few of the photographs from the day. The maximum speed the cars can travel is 20 mph, the first car above, to cross the finishing line at 10.45am - number 111, a 1902 Oldsmobile, 1 cylinder 4.5 HP driven by Andreas Melkus from Austria. Not far behind, above in car number 034, Robert Abery driving an 1899 Daimler, 2 cylinders 8 HP and car number 150 driven by Jiri Horice a 1902 Autocar, 2 cylinders 10 HP. In all, 23 countries are represented in an entry list, which includes 34 new participants on the Run, while a further 18 have returned after missing the 2016 event. John Dennis driving the car above number 125, knows exactly where he was on Sunday, 1 November 1959, he knows exactly where he was on Sunday, 6 November 1960, too. In fact, he can pinpoint where he was on the first Sunday of November of every year, ever since - bar one year in the 1990s, when he was in America on a business trip. 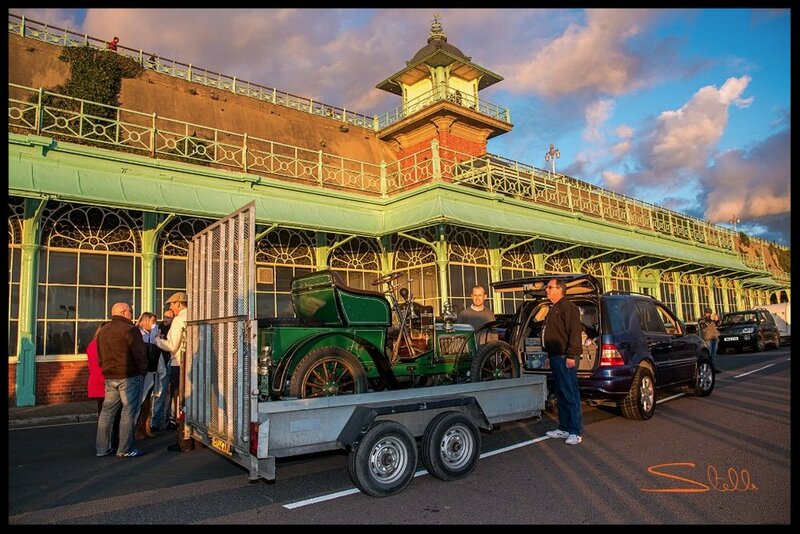 On the first Sunday of every November, Dennis has been behind the wheel of his veteran car, making his way from London to Brighton. Not just any veteran car either, but one made by his grandfather’s company 115 years ago. It’s a 1902 Dennis Tonneau, 1 cylinder 8 HP, built by the Guildford-based Dennis Brothers, a company better known today for its buses, trucks and fire appliances. 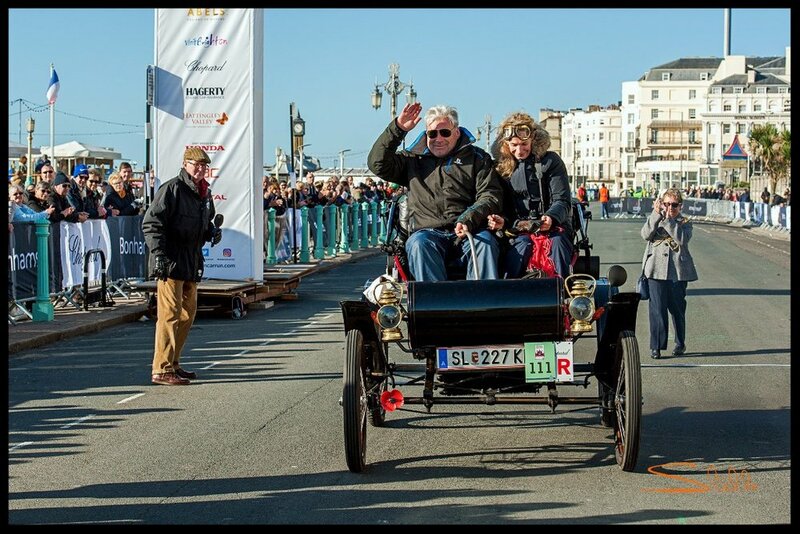 This year, John Dennis OBE drove the same car – registered P 26 – for the 58th time on the annual Bonhams London to Brighton Veteran Car Run. The car however, will be on its 66th Run, having completed eight Runs with John’s father at the wheel in the late 1940s and early 1950s. John and two other drivers who have taken part in 50 or more Runs are to be given special Gold Medals by the Royal Automobile Club in recognition of their remarkable achievements. 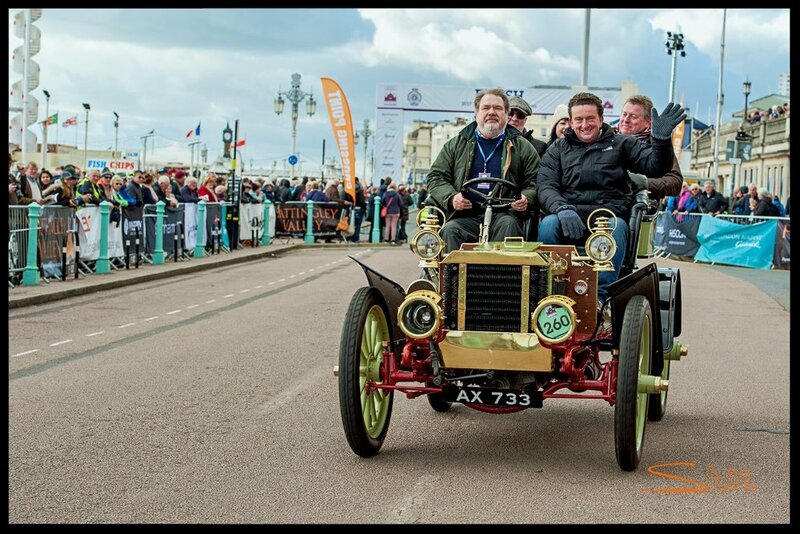 John will be joined at the ceremony by John Kemsley and John Newens below driving car number 312, his 1904 Star, 2 cylinders 7 HP - who have participated in 50 and 61 Runs respectively. Passenger, Charley Boorman TV presenter, travel writer and actor with driver Damon Hill OBE, British former racing driver, above in a 1904 Rover, 1 cylinder 8 HP from the British Motor Musem. Above photograph of Malcolm Barber Co-Chairman of the Bonhams Group, driving car number 260 a 1903 Peerless, 2 cylinder 16 HP. Guy Middleton above, has been the proud owner of car number 218, a 1903 Wolseley Tonneau, 2 cylinders 7.5 HP for the past seven years, and his father before him the owner since 1984. Guy has taken part in the Run on and off since 1983 as a passenger, he then completed a series of Runs in a single cylinder Bare as the driver. I asked him to share any special memories about any of the Runs, this is his reply: "The first Run we had a puncture in Croydon High Street. Fortunately, we had inner tubes, a jack and some tyre levers and when we got going again we received an amazing round of applause for changing a tyre in about half an hour! A few Runs later we hired mobile phones (the ones that look like a brick with a rat tail), we had to keep it in the umbrella basket!" I was also curious to know if he owns any other cars, and if so which was his favourite and why, Guy explained: "No, this is the only one and I have to look after it. We used it on our wedding day, to go from the church to our reception, so it does have a lot of great memories. At one point we had three cars in the Run, including my mother in a 1901 Baker electric. I shall wait and see if my daughters get the bug!" Guy above, driving with his friends. Ms Quirina Louwman above with her children and with her father driving 'Genevieve' their 1904 Darracq, 2 cylinders 12 HP, from the Louwman Museum in the Netherlands. This car was the star of the 1953 British comedy film 'Genevieve' - about two couples who took part in the Run. Always a pleasure to see 'Genevieve' and her faithful occupants at the Run! Above a 1901 De Dion, 1 cylinder 4.5 HP driven by Jerome Stevens. Following the Run were 60 auction winners who bid for a seat on one of three vintage buses. The 60 Go Bonkers to Brighton auction was organised by BBC Radio 2 DJ Chris Evans to raise money for BBC Children in Need. In the three years Children in Need has been involved in the Run, more than £741,000 has been raised for the charity. Many congratulations to them for raising much-needed funds for such a worthy cause! Above Chris Evans, seen here with Pudsey Bear, drove one of the busses - the passengers were the auction winners who bid for a seat to raise money for BBC Children in Need. Above presenter Alex Jones from BBC One, The One Show driving one of the 1950s Bedford coaches. Although the Run is not a race, in recent years the Chopard Regularity Trial has introduced an additional interesting element to the Run. The Regularity Time Trial starts halfway through the Run after participants have regrouped at the Crawley half-way checkpoint. The Time Trial starts at Crawley High Street and finishes 13 miles later at another checkpoint at Burgess Hill in Sussex. Before the Run, each entrant will nominate the average speed they think they will maintain over the 13 miles – the options are 8 mph, 10 mph, 12 mph, 14 mph, 16 mph and 18 mph. If no speed is nominated, the default average speed is set at 12 mph. The car and driver that gets closest to its nominated average speed wins the watch. This year’s winner of a Chopard Mille Miglia Chronograph, worth £4,900 is Ymer Sletter, who opted for a 12 mph average between the two points and came closest to his nominated speed. Driving a Cadillac dating back to 1904 shown in the photograph above (supplied), Sletter’s actual speed for the allocated section in the Sussex Downs was an amazing 12.01 mph. The crowds gathered to cheer and applaud the participants and their wonderful array of veteran cars on a sunny, but chilly Sunday. Above, an 1899 steam Locomobile, 2 cylinders 3.5 HP driven by Kempton Moody finished just before sunset. Safely back on the trailer and homeward bound! 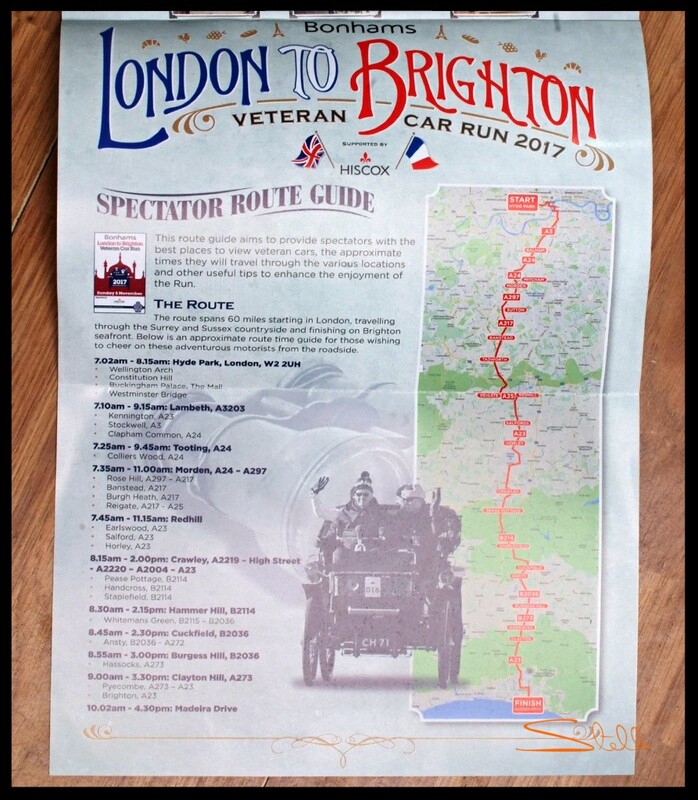 Thanks for reading, I'm already looking forward to Bonhams London to Brighton Veteran Car Run 2018! To view more photographs from the day please follow this link to my website. I'll be back soon with more news in the next week or so. 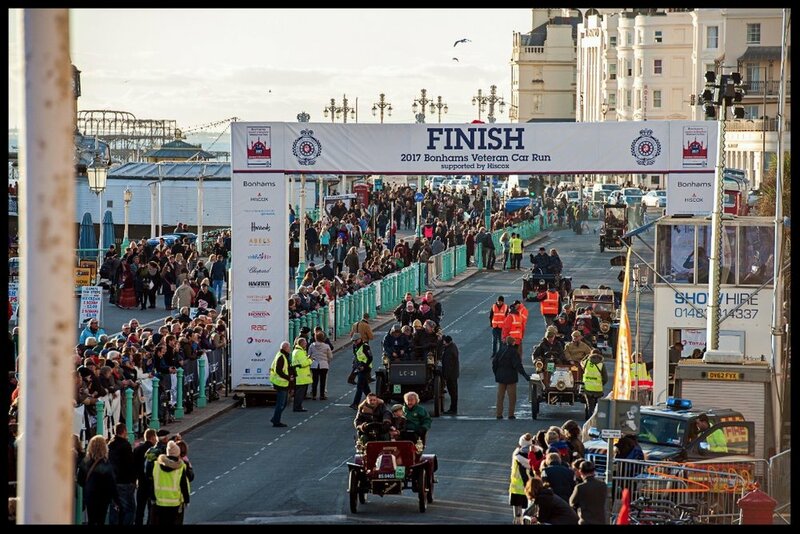 I had the pleasure of photographing the arrival of hundreds of Veteran Cars arriving at Madeira Drive. 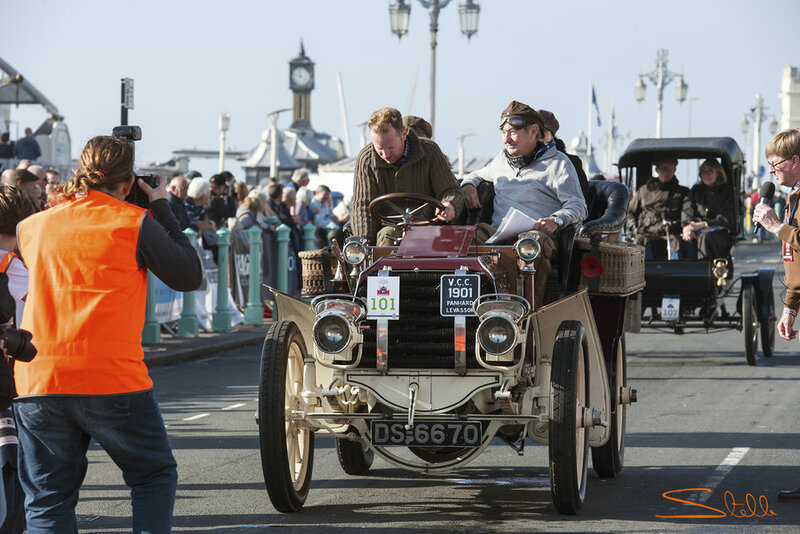 The 436 pre-1905 entries translated to 393 starters from Hyde Park on their journey to Brighton, with hundreds of spectators to cheer them on during the 60-mile route, which was bathed in autumnal sunshine. Below are a small selection of photographs from the day. Maderia Drive Brighton, the finishing line for over 300 veteran cars. There were 344 finishers, with the 25 patrols, 3 recovery trucks and 2 passenger ‘Taxi’s’ provided by RAC Motoring Services - complemented by the TOTAL mobile welding unit - attending around 175 breakdowns (some cars up to 5 times! ), providing recovery for 12 cars to service points at Honda Redhill and Gatwick, and providing welding services for 6 cars. I got to meet some very interesting people who told me about their family history with their cars; in particular a young man who remembers each year being a small passenger in his parents 1904 Cadillac, and this year is the driver with his parents as passengers, the VCR has played an important part in their lives. Commentators getting ready to interview the drivers to hear about their journey. Around 10.15am, some two hours after leaving Hyde Park the first participants crossed the finishing line, car number 263 a 1903 Mercedes driven by Mr. Chris Scott. First car back Mercedes 1903. Car 253 a 1903 Panhard et Levassor driven by Dr. Terence Bramall CBE. Car 051 a 1900 De Dion Bouton, driven by Mr. Simeon Barringer. Joy and delight for car number 203 a 1903 Cadillac driven by Mr. Philip Kadoorie. Following a respectful distance behind the early starters, were BBC Radio 2 DJ Chris Evans, plus BBC The One Show host Alex Jones, driving vintage buses full of passengers who paid for their ride of a lifetime by jointly raising more than £180,000 for BBC Children in Need. The 1950 Bedford OB buses provided by Lodge Coaches of Chelsmford, Essex. BBC The One Show presenter Alex Jones drove one of the coaches. Chris Evans, Alex Jones and dancing professionals from BBC One Strictly Come Dancing, Kevin Clifton and his wife Karen Hauer, who were amongst the passengers. Car number 158 a 1902 Mors driven by Mr. Philip Oldman. All welcome to come and watch. Car number 116 a 1902 Panhard Levassor driven by Mr. Tim Dickson. Car number 388 a 1904 Darracq driven by Mr. Graham Gregory. Family fun for car number 309 a 1904 Alldays driven by Mr. Christopher Thomas. Car number 379 a 1904 Darracq from the Louwman Museum driven by Mr. Louwman, seen here with his daughter Quirina and grandson Freddie. This is the car that played the lead in the 1953 film ‘Genevieve’ set against the background of the London to Brighton run. In the film this 1904 Darracq is the hobby of Alan McKim, a barrister played by the actor John Gregson; an interesting detail is that Gregson does steer the car in the film, but couldn’t actually drive! Thanks for reading, I'll be back in the New Year with more news from my world of cars and photography. The Salon Privé Concours d’Elegance is hailed as one of the finest concours competitions yet. This year, the 11th annual event, Concours d'Elegance has seen some of the world's rarest and most alluring cars on the lawns of the prestigious Blenheim Palace in Woodstock, held on the 1-3 September 2016. I had the pleasure of attending Boodles Ladies' Day on Friday 2nd September and quickly immersed myself amongst the stunning selection of more than 75 cars and bikes on display. We were treated to a wonderful Champagne lobster luncheon, English afternoon tea and complimentary bar, the perfect setting for a thoughtfully presented exclusive event. Closest to Furthest - Ferrari F50, Ferrari F355, Lamborghini Countach, Ferrari 458 Specialé, R35 Nismo Nissan GT-R GT3, BMW Z4 GTE. The best bit for me was watching, photographing and hearing the commentary for the Concours d'Elegance event, the judging for which had taken place the previous day. Me at work, not my usual attire! This 1956 Ferrari 500 Testa Rossa fended off rivals to steal the 'Best of Show' Salon Privé 2016 winner. Winner 'Best of Show' Salon Privé 2016. Taking 8 years to find and 2 years to restore, it made its post restoration debut at the 2015 Goodwood Revival Meeting. This 1965 Chevrolet Corvette Stingray C2 sold for £60,750 in the Silverstone Auction on Saturday 3rd September at Salon Privé. Thanks for reading, I'll be back soon with more news from my world of cars and photography. 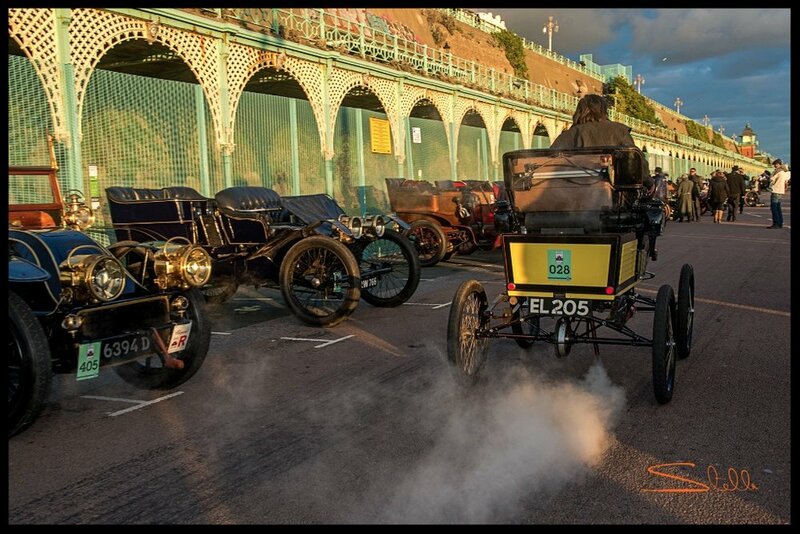 Bonhams London to Brighton Veteran Car Run 2015 I had been looking forward to the Bonhams London to Brighton Veteran Car Run for some time, particularly after I had photographed the Best of West Kent Veteran Car Run back in July. The London to Brighton run scheduled on Sunday 1st November is the world's longest running motor event, this year celebrates the 119th Anniversary Run, the pioneering cars from the pre-1905 era, the only event anywhere on Earth where so many veteran cars parade in such numbers, the participants dressed in period attire. Preceding the run an auction of veteran cars and memorabilia was held at Bonhams in New Bond Street, London. I went to photograph a little of what was on display - just to soak up a some of the atmosphere and learn more about this prestigious event. The centre photograph below shows four cars, the 1904 rear entrance Tonneau (front on the right) sold for £51,750 and the 1904 Winton (corner bottom left) sold for £130,000 including premiums. I found it fascinating to see the photographs on display from the early years, it put into perspective just how much effort goes into the run and how passionate the entrants still are to this day. Always well attended this truly unique motoring event represents the dawn of motoring, and right at the heart of the display, was a remarkable collection of 100 pre-1905 machines. As a curtain raiser to Sunday’s running of the annual Bonhams London to Brighton Veteran Car Run. This year’s star-studded judging panel included multiple-title winning F1 team principal Ross Brawn and TV personality Edd China. The remarkable 1901 De Dion Bouton Vis- à-Vis owned by Mr and Mrs Gigi Baulino was awarded with the overall prize. The outstandingly original machine has been in storage in Italy for nearly a century and is making its VCR debut this year. I wasn't able to get to photograph and enjoy this event, the supplied photographs below capture the splendor of the day showing Regent Street and the winning car. Below the winning car with the owners and entrants with co- chairman of Bonhams, Malcom Barber on the left who conducted the auction on Friday and Ross Brawn back centre and Edd China back right. 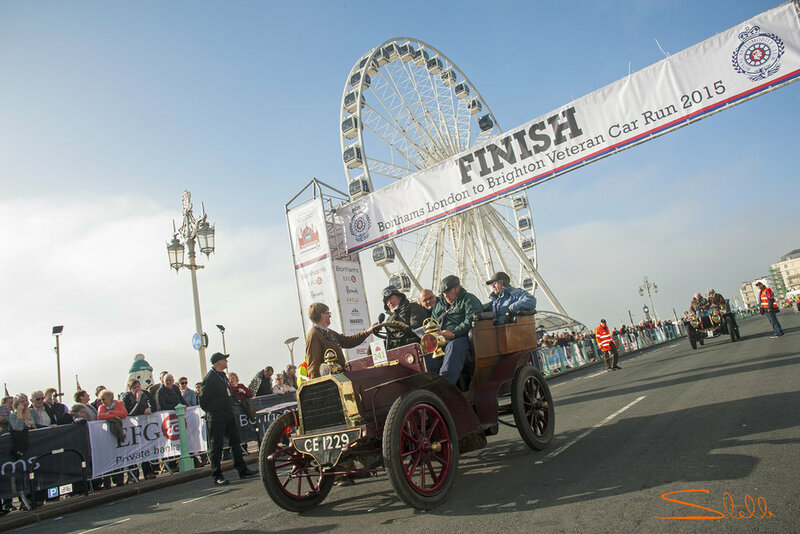 On Sunday 1st November at the crack of dawn more than 380 veteran cars dating back to 1898 started their engines at Hyde Park for the start of this year's 60 mile journey south through a misty London to Madeira Drive Brighton for the 119th Anniversary Run. I live half way between London and Brighton and made the decision to get to Brighton bright and early to capture the scene before the arrival of the first car over the finishing line. For only the third time in more than half a century, this year’s route took the intrepid participants ­– past Buckingham Palace and down The Mall before heading past Big Ben and over Westminster Bridge. The capital’s early morning mist added to the period Victorian atmosphere. The route took the cars through Lambeth, Norbury, Redhill, Gatwick, Crawley - the mid-way check point, down to Hammer Hill, Cuckfield and down into Brighton. I waited in anticipation to capture the first car over the finishing line, in unseasonably warm weather it was thrilling to see the first car back shortly after 10.00am - a 1903 Berliet, the participants were greeted by cheering crowds, blue skies and sunshine! 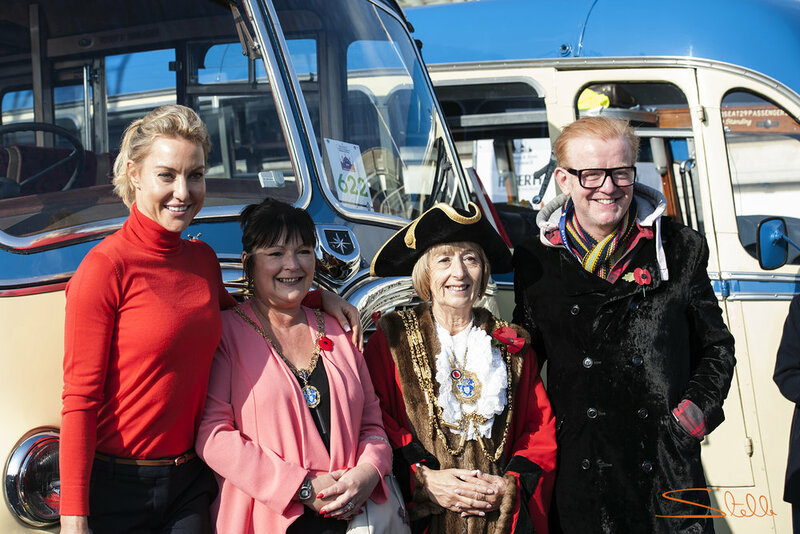 Amongst the veteran cars were three classic buses supplied by Lodge Coaches and driven by Radio 2 DJs Chris Evans and Ken Bruce and the One Show presenter Alex Jones, raising nearly £350,00 for BBC Children in Need, thanks to the generosity of their 40 passengers. The adventure – dubbed ‘40 Go Bonkers to Brighton’ was a huge success. Everyone looked do joyous and triumphant. Also taking part, Nick Mason drummer of Pink Floyd with the oldest car in his vast collection, a 1903 Panhard et Levassor. In total 342 of the starters managed to complete thejourney from Hyde Park to the Sussex coast before the 4.30pm deadline, thus receiving a coveted finisher medal. Of the 427 vehicles entered, only 342 cars made it over the finish line: 14 withdrew, 27 did not start and 44 retired. Below the first car back a 1903 Berliot. Camaraderie Hearing the commentary about how the generations of entrants had enjoyed the run from an early age and how they continued a family tradition made it all the more wonderful, everybody had their own special story to tell. The camaraderie was plain to see with many cars arriving together as they bonded on the way arriving in groups. I shall be back next year, but would love to be a participant, anyone have a spare seat for me? Bye for now, enjoy the weekend. On Sunday 13 September I attended the Goodwood Revival, I always look forward to going to this three-day festival held each September. This event isn't just for car and motor sport lovers it's an event for all the family to enjoy, the whole experience of living in a bygone era, with a merry go round and lots of fun things to see, do and buy. It's an educational visit for everyone! The car park even becomes part of the show as visitors line up their classics. This Youthquake display celebrates 50 years of the miniskirt. Preparation for the next race on the Goodwood Circuit. Mini's and Cortina during the St. Mary's Trophy part 2. It was a time of glitz and glamour, it felt like taking a step back in time. Goodwood's Earls Court Motor Show is a celebration of the greatest Ferrari road cars, including the 166 MM Barchetta from 1950. Each visitor to the Earls Court Motor Show at the Revival is given the opportunity to cast a vote for their favourite car and in doing so support the chosen charity. This year, in keeping with the commemoration of 75 years since the Battle of Britain, the Revival lent its support to the RAF Benevolent Fund, which supports serving and former members of the RAF in the UK and around the world. This years winner is the 1962 Ferrari 250 GTO. The lots were numbered between 101-176 and the auction was streamed live. For any of you who have seen auctioneer Max Girardo in action will know he conducts the auction with panache and zeal, communicating in English, French and Italian depending on the bidder. Max always makes these events exciting and entertaining with the help of Peter Wallman (left) who introduces each of the lots with a potted history. The star of the show, a 1958 Ferrari 250 GT Berlinetta Competizione ‘Tour de France’ which went for £4,250,000 on the hammer making competition history, it was exciting to watch as the telephone bids were coming in thick and fast. Ferraris as usual stole the show, with total sales achieved of more than £16.6 million. To find out more and to see the prices they were sold for please click here. Thanks for reading, I’ll be back in two weeks with more to share. Enjoy the weekend! Bye for now. Best of West Kent Veteran Car Run 2015 at Hever Castle Kent On Wednesday 29th July I photographed the Hever Castle part of the Best of West Kent Veteran Car Run. This is an annual event organised by The Veteran Car Club of Great Britain, with over sixty cars taking part, dating back to 1898 and the majority up to the end of 1918. The owners looked very proud as they drove their cars into the grounds of Hever Castle, having first arrived in the morning at Chartwell, Westerham, Kent, then onto Chiddingstone Castle and finishing at Hever Castle for a picnic lunch. It was wonderful to see so many cars over one hundred years old looking so resplendent in this picturesque part of the Kent countryside steeped in history. My photographs below tell some of the story. Buckmore Park Launch with John Surtees OBE and Paul Hollywood On Wednesday 15 July I was invited to the launch of the new Buckmore Park Kart Circuit, in Chatham, Kent. John Surtees OBE who is the only person ever to have achieved world championships on both two and four wheels, has recently taken ownership and wanted to spread the word. This is the track where Lewis Hamilton and Jenson Button practiced as youngsters. It is also where John’s own son Henry began driving as a child. John’s passion and enthusiasm will help to make Buckmore Park a major feeder for youngsters to further their career in motorsport, what better place to start. Buckmore Park is recognised as one of the UK’s premier outdoor karting circuits. A group of enthusiastic friends, associates, press and media individuals watched as John introduced us to the John Button Suite in memory of Jenson Button’s late father. John Surtees OBE founded the Henry Surtees Foundation as a result of a freak accident that ended his 18 year old sons life at Brands Hatch on 19th July 2009. Henry was one of the best young drivers of his era. The foundation was created to assist people with brain or physical injuries caused by accident to help them with their recovery. The John Button Suite in honour of John Button, Jenson Button’s father. These beautiful photographs were unveiled at the launch of them together. Photograph above of John introducing us to the track with his PA Sharon Bowness on the right and Rebecca Leppard on the left his PR manager. Paul Hollywood the ‘Great British Bake Off ‘ presenter took time away from filming to unveil a new fleet of 50 karts and demonstrated the 2016 modelSodi RT8 390cc before we were allowed loose on the track. Scott Malvern racing driver, driving the striking blue and yellow Formula 2 car used by John to win the 1972 Japanese Grand Prix. The photographs below show John in the middle with Paul Hollywood on the left and Scott Malvern on the right. I was amongst the first people to test drive the karts, I felt the adrenaline rush as I prepared in my red race overalls, protective gear and helmet, taking my place in kart number 5. It was a fun 7 laps, I don’t think I’ll take racing driving up any time soon as I managed to come last in my team. It was great fun, I can highly recommend it! I found it a great opportunity to capture this historic moment and to watch others enjoy it too, there was a lot camaraderie taking place. For those who preferred to experience the track from the comfort of the clubhouse there was a simulator which was just as popular. Photograph above of me in kart 5, thanks to Mariusz Goslicki for taking this one and the one below of me with Paul Hollywood and his son Josh. Good to meet the guys above from The Drone Company who shot this brilliant footage. Photographs above left Paul Hollywood in a reflective mood with his son Josh and on the right John Surtees OBE looking very proud. Photographs above a map of the track and my results. A great day out for all the family to have some fun time. Thanks for reading, I’ll be back in two weeks with more to share. Bye for now. On a wet and cold Sunday morning at the end of May I drove to Brands Hatch to watch the Classic Sports Car Club Summer Special Race meeting and to take a few photographs. The qualifying races took place in the morning and the main event in the afternoon. The previous day was warm and sunny and featured cars from the 60's and 70's and was much busier than the Sunday. With it's iconic track and the wet surface, the Brands Hatch circuit was going to be a challenge for the most experienced driver. There were six races featuring the Modern Classics Series, Toyo Tires Jaguar championship, Magnificent Sevens, New Millennium and Dunlop Puma Cup Series and Tin Tops. The photographs below show how it all panned out. The photograph above shows Tom Eden driving a Caterham 7 who came 2nd in the CSCC Gold Arts Magnificent Sevens Group 2. Above - The Modern Classic Series showing a bumper grid of 90's machinery with Miles Maserati driving car number 46 as the winner. Above - Toyo Tires Jaguar Saloons were the second race of the day with Sam Clarke Jnr. taking 1st place in car number 126 and David Howard in car number 55 in 2nd place. Above - The winner of the CSCC Gold Arts Magnificent Sevens - Group 2 was Peter Ratcliffe in car number 1 with Tom Eden in 2nd place in car number 64 and Jonathan Gibbs in 3rd place in car number 41. Above - CSCC New Millennium & Dunlop Puma Cup, father and son Alan and James Broad in 1st place in car number 76. Above - CSCC New Millennium & Dunlop Puma Cup in 2nd place Nikolas Barton in car 199. Above - Liam Crilly filling up his Mazda RX8. Above - CSCC Gold Arts Magnificent Sevens Group 1 Stephen Mansell in 1st place in car number 5. Above - It wasn't smooth going for everyone though. Above - The last race of the day CSCC Tin Tops with MS Society, I was cold and wet to see the end of this one so can't let you know who won, but this is what it looked like at the start! A big thank you to Hugo Holder the Competitions Director and Club Secretary, at Classic Sports Car Club for inviting me to enjoy this event. Say thank you to your dad this Father’s Day and spoil him with a memorable day out. In partnership with John Surtees and the Henry Surtees Foundation, Hever Castle presents a collection of F1 cars, classic cars and motor bikes from the John Surtees collection. I have been invited to showcase my classic and supercar photography at this prestigious event with framed Limited Edition photographs for sale. Featuring the photograph below, home of the Spitfire taken at the Biggin Hill Heritage Hangar, and an F-Type Jag courtesy of AutoPrive, using a Leica medium format camera. What I particularly love about photographing with a Leica is the quality of the lens, capturing crystal clear clarity. Thanks for reading I'll be back in two weeks time with more to share. Bye for now, enjoy the weekend! On Wednesday and Thursday I photographed the setting up of The Elite Show London, a luxury lifestyle experience, set in the opulent surroundings of Rizon Jet at Biggin Hill Airport. The scene has been set with an array of super cars and jets on display amongst a select variety of luxury goods. Below are a few of the images I took just to whet your appetite. The photograph above was taken using 5 images spliced together, this is called High Dynamic Range. The reason for taking a series of images at different exposures is because it's not possible to get a consistent exposure in one single shot. The light inside the hangar is much darker than outside. By taking 5 images in rapid succession at varying exposures and processing in Photoshop one image with an even exposure is made. The images below starting top left and finishing bottom right show the five images that were used to create the final one. The spitfire below is on display at Intrepid Design alongside some innovative furniture created using decommissioned and recycled aircraft parts. You can even visit the guys from the Heritage Hangar to book a short flight in a Spitfire too! The photograph below is how it looked yesterday afternoon, before the cars and jets arrived. The lodge back right is by Waterside Holidays, by the end of the day I felt like curling up and going to sleep, it's so homely! If you get the chance to visit, either today Friday 8 May, or tomorrow Saturday 9 May you're in for a luxurious time. This link will tell you more. Thanks for reading I'll be back next month with more news. On Sunday 26 April I went to the 17th annual London-Brighton Jaguar Car Run which started at Chartwell, Westerham, Kent - family home of Sir Winston Churchill, to photograph the start of the run. The run is organised by Jaguar World magazine in association with the Jaguar Enthusiasts' Club. There were over 300 Jaguars scheduled to drive through Westerham starting at Chartwell for breakfast, getting ready for their start times between 8am and 10am. 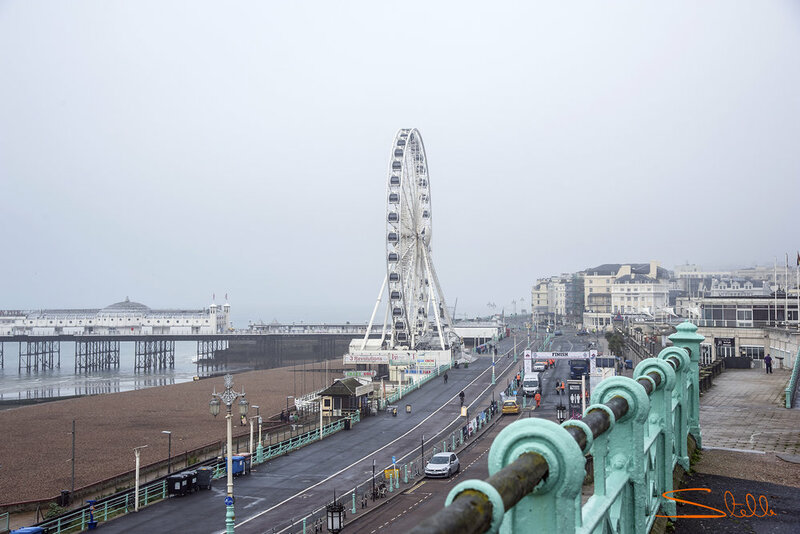 The route they followed took them on the B roads and finished at Madeira Drive in Brighton where the presentations were due to take place in the afternoon. You may remember that after the heat wave during the week, Sunday morning was forecast to be a cold, very wet, wintery day and the forecast wasn't wrong! I arrived at Chartwell at 7.30am equipped for the rain with camera bodies and lenses protected with plastic bags (I find the small Boots ones are best, turned inside out). This allows you to work fast without the worry the rain will seep into the equipment, leaving enough room to look through the viewfinder and operate the controls, and most importantly the freedom to walk fast without the worry that anyone is trying to shield you with an umbrella. Might sound crazy but it works! The weather didn't stop the owners of this Jaguar C-Type Enduro/Proteus Replica 1953 taking part from the Netherlands! There were a huge variety of Jaguars, too many to mention, in particular the three Union Jags. The styling of the Union Jag is based on the stunning XK8. This luxury convertible was inspired by Jaguar’s famous old XK-E (E-Type) sports car of the 1960s. I photographed the trio outside Chartwell. If you would like to hire them for your wedding, fun day out or corporate event please take a look at the Union Jagwebsite, you can't get more British than that. I hear it was a smooth run and sunny in Brighton, well done to all who took part! Car of the Run Award was presented to Peter Hall with his MK 9 1961 Jaguar, presented by the Mayor of Brighton. The Elite London now in it's second year - will celebrate the luxury lifestyle world by showcasing jets, super cars and featuring stunning brands from fine art to fashion and luxury gifts to exquisite jewellery. Visitors will be treated to a selection from the world's most respected companies and sought after brands. To book your tickets please click here. Photograph below supplied from last years event. I'll be back next week with more news.